"The Sun's energy is always flowing past our world," said Fox. "And even though the solar wind is invisible, we can see it encircling the poles as the aurora, which are beautiful—but reveal the enormous amount of energy and particles that cascade into our atmosphere. We don't have a strong understanding of the mechanisms that drive that wind toward us, and that's what we're heading out to discover." One of those questions is the mystery of the acceleration of the solar wind, the Sun's constant outflow of material. Though we largely grasp the solar wind's origins on the Sun, we know there is a point—as-yet unobserved—where the solar wind is accelerated to supersonic speeds. Data shows these changes happen in the corona, a region of the Sun's atmosphere that Parker Solar Probe will fly directly through, and scientists plan to use Parker Solar Probe's remote and in situ measurements to shed light on how this happens. 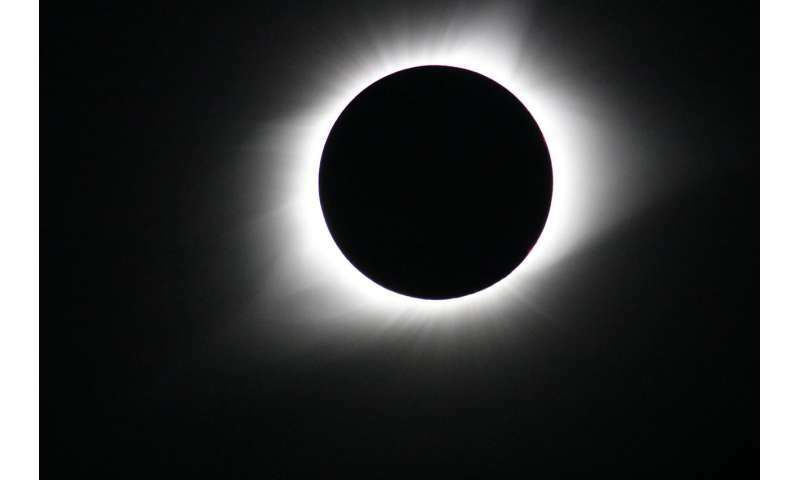 Second, scientists hope to learn the secret of the corona's enormously high temperatures. The visible surface of the Sun is about 10,000 F—but, for reasons we don't fully understand, the corona is hundreds of times hotter, spiking up to several million degrees F. This is counterintuitive, as the Sun's energy is produced at its core. Another suite, called SWEAP (short for Solar Wind Electrons Alphas and Protons Investigation), uses two complementary instruments to gather data. The SWEAP suite of instruments counts the most abundant particles in the solar wind—electrons, protons and helium ions—and measures such properties as velocity, density, and temperature to improve our understanding of the solar wind and coronal plasma. SWEAP is led by the University of Michigan, the University of California, Berkeley, and the Smithsonian Astrophysical Observatory in Cambridge, Massachusetts. Finally, the IS?IS suite—short for Integrated Science Investigation of the Sun, and including ?, the symbol for the Sun, in its acronym—measures particles across a wide range of energies. By measuring electrons, protons and ions, IS?IS will understand the particles' lifecycles—where they came from, how they became accelerated and how they move out from the Sun through interplanetary space. IS?IS is led by Princeton University in New Jersey. Parker Solar Probe's heat shield—called the thermal protection system, or TPS—is a sandwich of carbon-carbon composite surrounding nearly four and half inches of carbon foam, which is about 97% air. 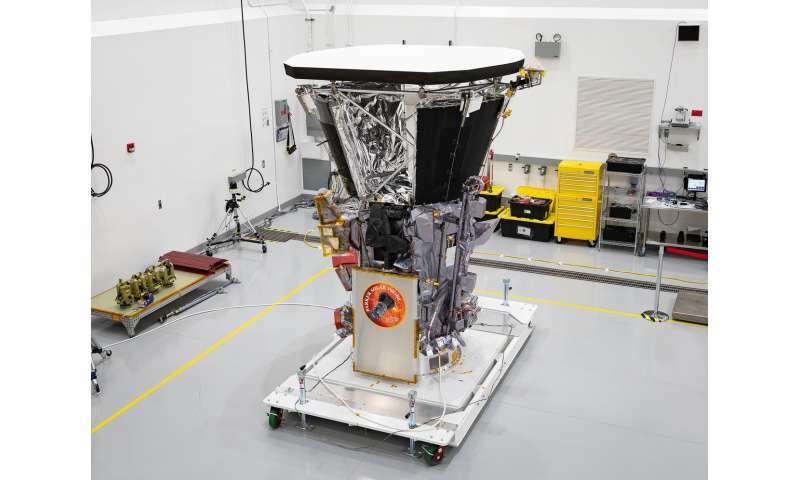 Though it's nearly eight feet in diameter, the TPS adds only about 160 pounds to Parker Solar Probe's mass because of its lightweight materials. Though the Delta IV Heavy is one of the world's most powerful rockets, Parker Solar Probe is relatively small, about the size of a small car. But what Parker Solar Probe needs is energy—getting to the Sun takes a lot of energy at launch to achieve its orbit around the Sun. That's because any object launched from Earth starts out traveling around the Sun at the same speed as Earth—about 18.5 miles per second—so an object has to travel incredibly quickly to counteract that momentum, change direction, and go near the Sun. The timing of Parker Solar Probe's launch—between about 4 and 6 a.m. EDT, and within a period lasting about two weeks—was very precisely chosen to send Parker Solar Probe toward its first, vital target for achieving such an orbit: Venus. The spacecraft will perform a gravity assist to shed some of its speed into Venus' well of orbital energy, drawing Parker Solar Probe into an orbit that—already, on its first pass—carries it closer to the solar surface than any spacecraft has ever gone, well within the corona. 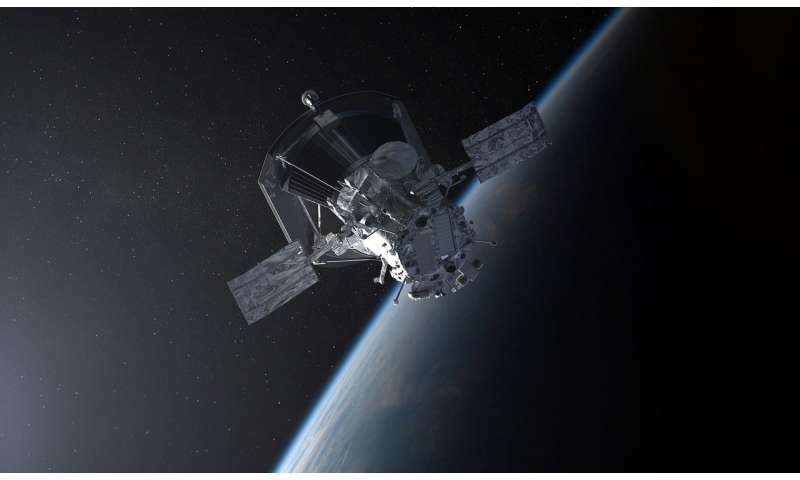 Parker Solar Probe will perform similar maneuvers six more times throughout its seven-year mission, assisting the spacecraft to final sequence of orbits that pass just over 3.8 million miles from the photosphere. "By studying our star, we can learn not only more about the Sun," said Thomas Zurbuchen, the associate administrator for the Science Mission Directorate at NASA HQ. "We can also learn more about all the other stars throughout the galaxy, the universe and even life's beginnings." Good for NASA. Space exploration, more; global-warming, less.